Suspect Wayne Allen Huntsman, 37 held for arson, deliberately setting the King Fire and was being held in lieu of $10-million bail, according to the El Dorado County Sheriff's Office. Wayne Allen Huntsman was arrested in Placerville after investigators interviewed numerous people and developed multiple leads, El Dorado County Dist. Atty. Vern Pierson told reporters at a midday news conference. The arrest was announced at a morning news conference in Camino attended by Calfire Director Ken Pimlott, U.S. Forest Service officials and the El Dorado County District Attorney Vern Pierson and Sheriff John D’Agostini. It was revealed at the news conference that the fire was set near Pollock Pines in very steep terrain. A Calfire investigator was the first to find the origin of the fire and begin the investigatory process that led to Huntsman’s arrest. 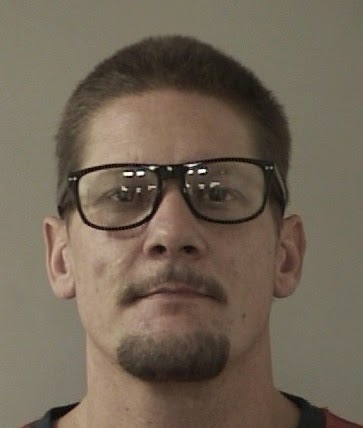 Pierson said that law enforcement had been in contact with the suspect in the days prior to his arrest in Placerville. Huntsman will be arraigned at 1 p.m. Friday in El Dorado Superior Court. Officials would not say how they believe the fire was started, citing the ongoing investigation. Extending the TFR 1 mile north of French Meadows Reservoir. Per AA, north end of the fire is currently just south and west of Hell Hole Reservoir, and 2 miles south of French Meadows Reservoir. No imminent threat to buildings and facilities at the reservoir, but requesting a strike team of engines for structure protection this afternoon and evening for Branch 6. UPDATE 9-18-14 0830: 70,994 Acres & 5% Contained, growing 50,014 Acres in 24 hours, The fire remained active overnight. Incident personnel determined that the fire made a run of over ten miles north between 1600 yesterday and 0600 this morning. Conditions: The King Fire is burning in steep terrain in the South Fork of the American River Canyon and Silver Creek Canyon, north of the community of Pollock Pines. the fire made a significant run to the northwest necessitating the mandatory evacuation order for Quintette and Volcanoville. 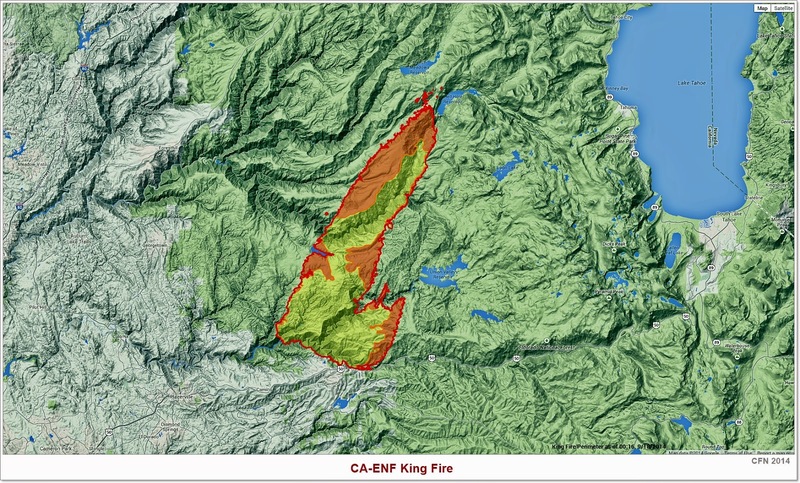 UPDATE 9-17-14 2030: King Fire on 11 pines road now according to cal fire at public meet last night. fire is moving mostly to the north, where it advanced several miles in some places. "A very active day." The fire is burning on steep hillsides in the south fork of the American River Canyon and Silver Creek Canyon, north of Pollock Pines. The fire made a big move to the northwest, requiring authorities to evacuate the hamlets of Quintette and Volcanoville. A total of 2,000 single family residences are threatened. Another 1,500 other structures are also in danger. Evacuations: Note- The mandatory closure to all residences south of Highway 50 between Fresh Pond and Riverton has been changed to a voluntary advisory. The eastside of Forebay Road from King of the Mountain Road to Pony Express Trail. All roads north of Pony Express Trail from Forebay Road east through Bullion Bend. White Meadows Road and Spring Valley Road. Voluntary Evacuation Advisories - All evacuations have been lifted for the communities of Gold Ridge and Lakewood Spring. For residences south of Highway 50 between Fresh Pond and Riverton the advisory has been downgraded to voluntary. A Voluntary Evacuation Advisory is still in place for Volcanoville, Quintette, and residents located west of Forebay Road from Blair Road to Pony Express Trail. Additional Voluntary Evacuations Advisories are in place for Badger Hill Road, Marmot Road, Lucky Mine Road, Old Blair Mill Road, Apple Creek court, Applemont Ranch, Chickaree Lane, Longs Creek, Quick Silver Road, Quick Silver Court, and Baltimore Road. Evacuation Shelter Location: The evacuation center has been moved to the Camino Seventh-day Adventist Church. The address is: 3520 Carson Road in Camino. Another Red Cross Evacuation center is located at 6530 Wentworth Springs Road, Georgetown, CA 95634. Road Closures : Highway 50 is now open. Forebay Road at Blair Road and at Forebay Road at Pony Express Trail. Acres Burned - Containment: 27,930 acres - 5% contained. Cooperating Agencies: EDSO, CHP, American Red Cross, Cal OES, El Dorado Irrigation District, Sacramento Municipal Utility District, PG&E, El Dorado County Animal Control, Sierra Pacific Industries. Conditions: The King Fire is burning in steep terrain in the South Fork of the American River Canyon and Silver Creek Canyon, north of the community of Pollock Pines. This afternoon the fire made a significant run to the northwest necessitating the mandatory evacuation order for Quintette and Volcanoville.